SUMMARY: The Fender FA-100 is an excellent starter guitar for an older child or teen. It doesn’t have the sound quality of higher-end models, but for what you are paying it is excellent quality. 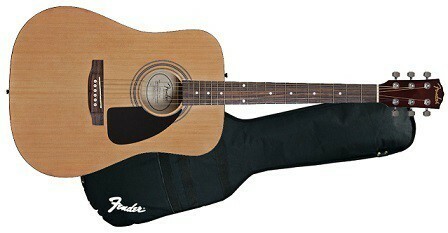 The Fender FA-100 Dreadnought Acoustic Bundle is a great option for a starter pack for a beginner. With this kit, you get a full sized guitar that would make a good first instrument for a teen from one of the top brands, Fender. The cool thing about this model is you get the Fender Headstock shape and the Fender traditional bridge, which is quite usual with such a cheap guitar. With this package, you can be pretty sure you will get a reliable instrument along with everything else that a beginner guitar player needs. The Fender FA-100 is the traditional dreadnaught shape that creates a sound that is great for most types of music. It has a laminated back and front that is quite shiny, but it looks good. For a beginner model, it has great playability, it is very comfortable and is lightweight which is perfect for kids and teens that have smaller bodies. The FA-100 is easy to tune, especially with the tuner that is included in the kit. For a budget guitar, the sound is outstanding. It has a nice clean tone with no buzzing on the fretboard. There are a few issues with quality that could be better, but generally, the way the guitar is built is good enough for most beginners. These minor flaws (glue spots, sharp frets) won’t affect the sound or playability. It is a budget beginner guitar, so it is not recommended for someone who has a lot of experience. A skilled player would probably have some issues with the sound and the craftsmanship of the FA-100. This starter kit is an excellent value for a name brand guitar. You get everything that a beginner needs including a gig bag, tuner, strap, instructional DVD and picks. Even though this is probably Fenders cheapest model, Fender is a very reliable brand, and with this package, you are getting a very good instrument for the price.